I knew I still had this photo somewhere! 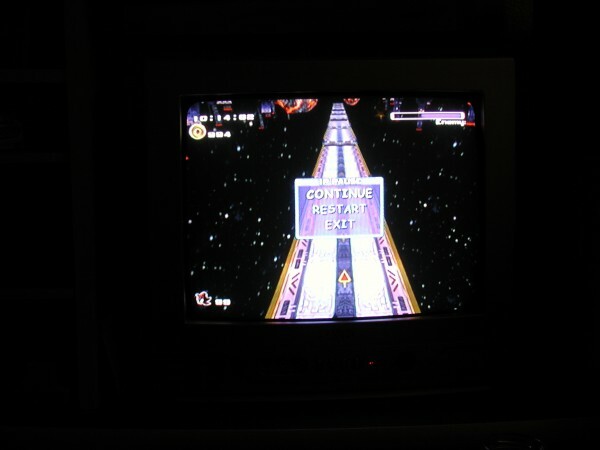 This is from the second Sonic versus Shadow boss battle in Sonic Adventure 2 Battle, and yes, it's a photo of a TV (because back in 2002 I didn't have a TV capture card). In a nutshell the battle is an infinite race along a collapsing bridge to the core of the space station, with you trying to whittle down your opponent while dodging their special attacks. For all that it's hard to land hits on the enemy I actually find it a surprisingly relaxing battle. It's possible to get into a nice rhythm of light dashing through the lines of rings, and if your timing is just right then your opponent will never spawn in the middle of a path of rings and so you never hit them. It's a very good level for getting a ludicrous amount of rings and extra lives - until you reach the 999 ring limit. The only downside is if you keep it up for about 10 minutes, then you discover that the infinite road is really finite as you loop back to the start and realise that all the platforms in front of you have collapsed into the abyss. I managed to keep going long enough for this I think just once, and The Gnu after a few attempts got a clear photo of the TV screen. I'm not sure how many players ever discovered this.